They get a bad press in Germany… but now this clip can exclusively reveal the difficulties neo-nazis experience on a daily basis. Is it time to hug a neo-nazi after all? This is an exciting moment for me. 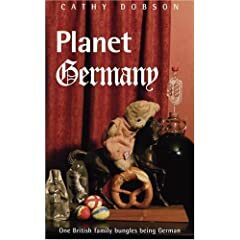 My book, Planet Germany, has been reviewed in the Telegraph. (You have to scroll down a bit to find the right bit). I think I might raise a glass of something bubbly tonight. Remember how the Germans used to be portrayed when we were younger? Growing up in the sixties and seventies our perceptions of Germans were entirely oriented around imagery from the second world war – whether it was films like the Dambusters, or series like Colditz and Secret Army, or comedies like ‘Allo ‘Allo or humourous sketches like this classic from Dave Allen. What a let down it is to find out that Germans are actually quite normal people. Nobody works harder than ex-pats to keep their national traditions alive. At least, that’s what I always thought, based on observed ex-pat rituals. So it was no surprise to find out that second and third generation German-emigrees are sometimes more German than the Germans… and cherish customers, rituals and recipes which no German would actually recognise. I discovered this touching clip on Youtube – note the very German hat (you know how Germans make their children wear hats with odd tassles and pom-poms). For anyone who was confused by that clip – a quick reminder of what real German cuisine is all about. Does anyone else accumulate odd artefacts which gather dust and cobwebs on your walls? I’m a flea market addict. I love browsing junk shops and bric-a-brac stalls and picking up old objects which my family of Philistines say just clutter up our home. To add to the dispute, I’m totally and completely useless at housework… and our house is the premier breeding ground for spiders in all Germany. So my flea market treasures normally have a delightful frosting of dust and some cheery swags of cobwebs festooned across them for good measure. Here’s a picture of one part of my living room wall. 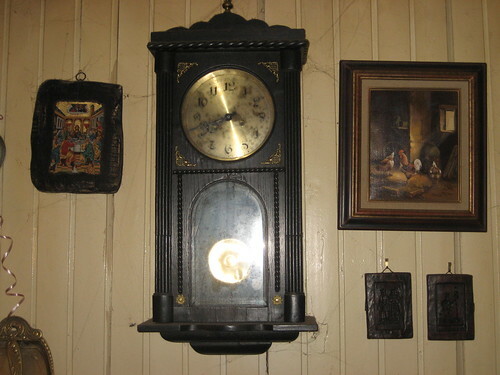 The clock came from a flea market just up the road. It still goes…as long as you remember to wind it up every day. And it has a lovely chime with deep bongs every half an hour. The picture on the left is an icon of the Last Supper I picked up in Greece. And on the right is a French painting of some chickens which my father gave me once… I really love that one. Under it are two moulds – also from a flea market. I’m not entirely sure what they were used for. They’re made of wax, they’re finely carved with figures in crinolines… and they man I bought them from said he got them from an old “Konditorei” (pastry shop) – though he wasn’t sure what they were used for either. If anyone else fancies showing what they have on their wall, please do have a go! Leave a link here, and we’ll all come and have a look. We’re all told that German is a difficult language to learn. Its grammar is grisly, its pronunciation prickly and its cases catastrophic. Well now I can reveal…exclusively to readers of this blog… that there is an easier way to learn German. It’s effective and quick. Throw away those grammar books and try this method…. I think this video could be a metaphor for a phone conversation I had yesterday. It was one of those situations where I understood every single word… but nothing in the sentences made any sense. Anyone else ever have those days?